Butterfly Jewelry and much more! 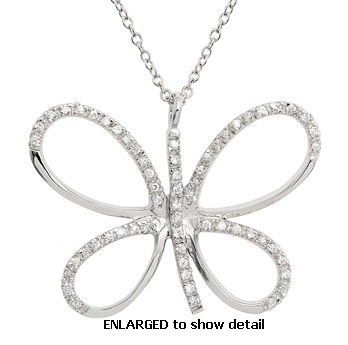 Nickel-free Sterling silver, cz butterfly cut-out necklace. Includes a 16 inch adjustable chain. Also includes a rhodium plate finish, which gives it its lustrous white gold appearance. All of our cubic zirconia items are also made with Grade A quality stones with a high-shine finish. All of our CZ pieces are always set and never glued on. Includes a 16" adjustable chain.